Looking back it seemed like a good idea, maybe even a great idea. Now, I'm not so sure. I'll let you be the judge. I was surfing around the other day and I saw this post over on CarDomain.com (for those of you that don't make the jump, it's a post about pumpkin carving and cars) I thought, hmmmm, I wonder if I could do that with a Porsche? Man of action that I am, I fired off a quick email to Paul Chenard asking if he could put something together for me (Paul's the artist that designed my new logo and built that gorgeous Porsche 934 Turbo RSR I posted about the other day.) Paul responded almost instantly saying "no problem" and a couple hours later the design below arrived in my mailbox. Perfect, I thought! Let's put my pumpkin carving skill (or lack there of) to the test. Following the instructions, I printed out the template, pasted it to the pumpkin and began to transfer the outline onto the skin of the pumpkin using both a push pin and a pen. The design is a simple negative; cut out the black areas and leave the rest. If done correctly, you get a nice carving that you would proudly display in your garage. At least that's how it's supposed to go. I rapidly realized that I possibly bit off more than I could chew. 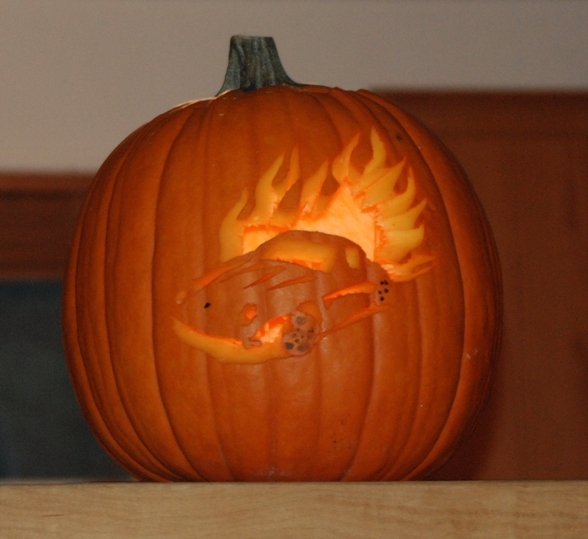 The design, while a classic pumpkin carving negative, is quite intricate. Having never done this before I thought my little pumpkin carving kit from the local hardware store would be just fine. What I didn't count on was a pumpkin skin tougher than titanium and thicker than well... my head. Regardless, I decided to push ahead. If you decide to try one for yourself, I would highly recommend some type of rotary tool. Looking at the finished product in the light, I didn't think I had done such a great job. See for yourself. Thankfully, just as people tend to look better in candle light (or after a few beers) the same can be said of my Porsche Pumpkin Carving. See for yourself below. What do you think? Here's the deal. Try carving one yourself by using this template and the instructions at the end of the post. Once you're done, leave a comment on this post and I'll send you an email address to send me a picture of the completed pumpkin carving. All entries must be received no later than 3:00 pm EST on October 30, 2008. An independent panel of judges (my wife, dogs and a few friends) will decide which Carrera carving is the best and declare a winner on Halloween (complete with the winning picture.) What do you win? How about a copy of Porsche: The Road from Zuffenhausen. This lavishly illustrated hard cover history of Porsche has a $75.00 cover price and is currently selling on Amazon for $47.50. Good luck and have fun carving!!! Purchase a pumpkin large enough to manage the stencil. In my case I had someone else pick it out and deliver it. Cool ! Where did you find that perfect size pumpkin ? Mine was hand delivered for less than $.50 per pound. Better yet, once dropped off, I wasn’t even billed. 🙂 Thanks for the pumpkin! I did this for my nephew he wanted to have a car pumpkin soooo bad so I had to do it I think it came out well hope you like it. You can post to our facebook page or send to us at pumpkins at flatsixes dot com. Thanks! I’ll try my hand at this – please send me an address for my attempt!